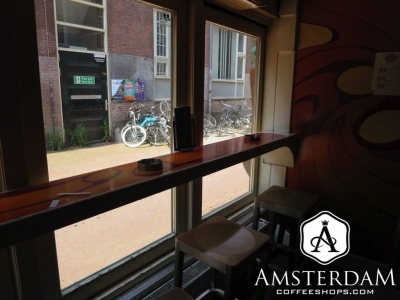 Dampkring Coffeeshop (formally De Dampkring) is located on Handboogstraat (Longbow Street), in the famous upscale shopping area surrounding Kalverstraat. The name De Dampkring means “The Atmosphere” in Dutch. It may be an ideal choice. 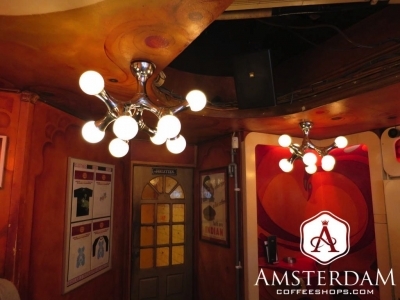 Dampkring has grown to be one of the most famous coffeeshops in the city. Much of this has to do with its décor and atmosphere. Dampkring is simply stunning, inside and out. When one first approaches this place, the first thing they notice is the ornate façade. 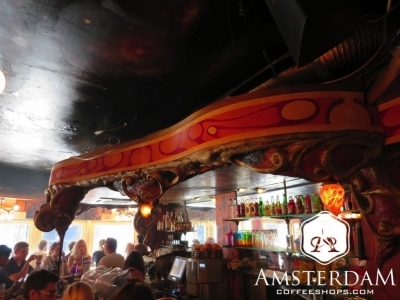 With hand-carved panels and pillars alongside stained glass, it is arguably the most intricate in the coffeeshop business. We would put it amongst the most notable in the city. It is that beautiful. Inside, the shop is no less interesting. As you walk in, you immediately notice that the entire room is encased in art and color. It is difficult to put it into words. Trying our best to explain it, we sum it up like this. The walls are all painted in a textured 60s psychedelic-style. There are unusual columns holding up the custom ceiling, which is also painted and abstract in its form. The tables, bar, and counters are similarly all custom made of beautiful polished wood, and with trippy abstract textures. Unusual lights can be found throughout, some taking on the shape of distorted bubbles or ball clusters. The management describes the décor as having a combination of Arabic, Bohemian, and Buddha influences. Who are we to argue? All we know is, the décor is amazing. 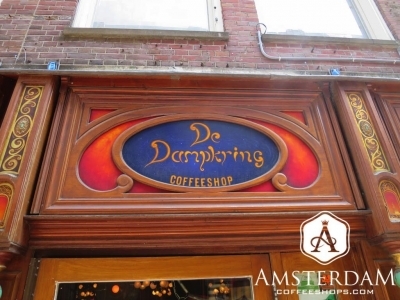 Dampkring coffeeshop is perhaps most noted for being featured in the major motion picture Oceans 12. A famous scene was shot here that featured George Clooney, Matt Damon, and Brad Pitt. 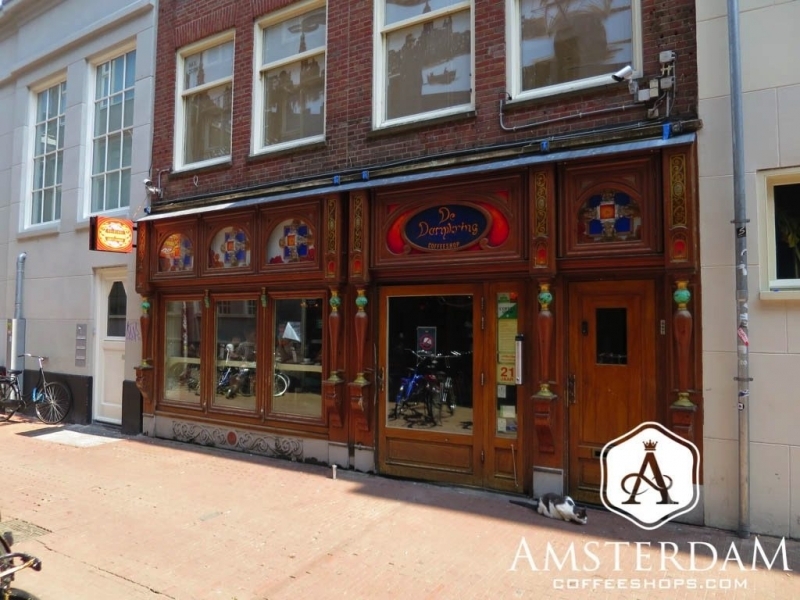 The appearance catapulted the profile of this shop to that of a major Amsterdam attraction. 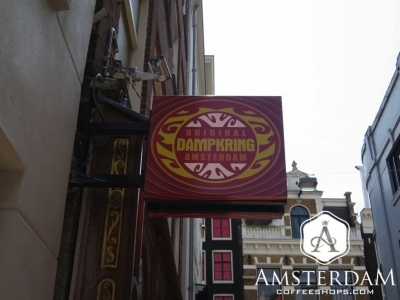 Damprking is now on many visitors “must see” list, some of whom are not even cannabis smokers... they just want to see the coffeeshop featured in Oceans 12. For the rest of us, management was smart enough to name a strain after the movie. Ocean’s 12 Haze has been a long-standing basic (and popular) item on the menu ever since. Dampkring has long had a reputation for quality cannabis. This is identified as a connoisseur establishment. Further, they have one of the most extensive cannabis menus in the city. On any given day they may list roughly two dozen flower (weed) strains, and a dozen or so types of hashish. The menu details each strain type (indica or sativa dominant) or hashish origin, along with a description of its smell, taste, and effect. The marijuana products are purchased in the back of the shop, where they have a special counter and extensive display of the offerings. This shop also has plenty of options for coffees, teas, juices, soft drinks, and snacks if you plan on staying. 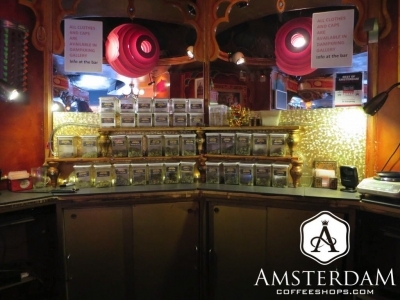 Dampkring Coffeeshop is a famous themed coffeeshop located in a busy shopping district south of Dam Square. They have an upbeat vibe, stunning decor, and connoisseur quality cannabis products. This is an excellent establishment worthy of a special trip.